Gulf Shore & Netties 1270 and 1204 Estero Blvd. Both shared the same distinction of great food, drink and dancing. As neighbors, they shared the same beachfront and hurricanes which in time changed their names but not their popularity on Fort Myers Beach. The "Gulf Shore" was built by Tom Phillips but was first known as Pete Nelson's "Crescent Beach Casino" when Estero Island was called Crescent Beach, until 1925. Built originally as a bathing casino with rentals of a bathhouse, swimsuit and towel. He also sold hot dogs and hamburgers to visitors parked along the wide shoreline, as seen above. Later additions included a gambling casino with dance floor, becoming a restaurant after the 1926 hurricane. 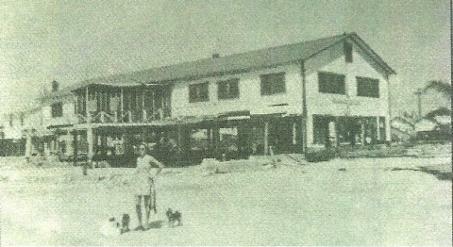 In 1930 the name changed to "Gulf Shore Inn" when rental rooms were added, and became popular with winter visitors. During the 1940's, it was home to officers stationed in town during WWII, and after the 1944 hurricane, as seen above. Hurricane repairs and construction were completed with more remodeling after the relentless "no name" storms in the 1950's and Hurricane Donna in 1960. By 1997 another name change occurred when "The Cottage" next door was acquired and named just that, as an indoor/outdoor bar with deck adjacent to the original dining room. It was renamed "The Gulf Shore Grill" and today both remain with the same familiar beachside view, riding out Hurricane Charlie in 2004 and other nuisance storms on the more recently renourished Gulf shore in 2011. Meanwhile, next door, in the 1930's along this same spacious shoreline was one of the first and best restaurants on the beach, known as the famous "Nettie's Place". It was run by the Pavese family, known to serve the best Italian food in all of Lee County. 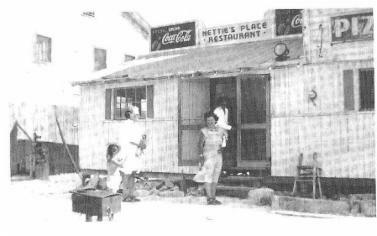 People drove all the way down to the beach for "Nettie's Spahetti" for years, as pictured above. 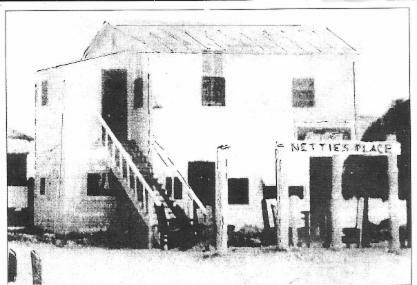 The structure was severely damaged in the 1944 and 1947 hurricanes, then rebuilt, as seen here below, as "Nettie's bar". It was completely wiped out with the "no name" series of storms and closed in 1954. The next time it was rebuilt as a large, concrete building, to the rear of the property, facing Estero Blvd. and promptly named the "Surf Club". It was indeed the surf which moved it to higher ground, as a bar and package store for many years, surviving Hurricane Charlie in 2004 and other anoying storms. In 2010 the Surf Club was renamed "The Mermaid", and today remains a popular place away from the familiar, stormy, now-renourished Gulf front shoreline.